TITUS IULIUS SABINUS: The Eagle on the Danube. The Eagle on the Danube. 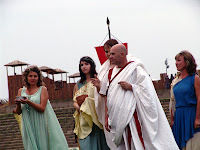 Between 26 - 29th of June I participated to the Novae Roman Festival organized in the modern city of Svishtov, Bulgaria. - The Nova Roman flag consecration. - The Nova Roman ritual to the Gods. - Nothing, but nothing, can replace the face to face meetings and these meetings represent the only way to effective discuss about Nova Roma possible ways of development. - To meet our citizens in person is the best thing can happen in one's life and I'm honored to meet the wonderful Pannonia's citizens and to observe their impressive dedication to Nova Roma; L. Livia Plauta,Cn. Cornelius Lentulus and T. Popillia Laenas has all my respect for the way they organized, participated and put in practice the official moments of Nova Roma participation to the festival. - Romans and barbarians reenactment groups around the world respect each over and, through collaboration during the festival, they demonstrated that the passion for all Roman things but not limited to that and the passion for Roman history, has no frontiers and national backgrounds. At last, we all are the members of the same family dedicated to reenactment. I want to present my special thanks to Legio I Italica who helped us in the friendliest possible way. Because them our presented moments were more impressive. Near that help they demonstrated consideration and respect to Nova Roma and I think this is the result of our co-fellows from Italia promotion of Nova Roma in Italy.